'Home' is such a beautiful word. The four letters mean so much to a homebody like me and many others. Doing up or dressing up a home has so many facades to it. It's not just the pieces of furniture but a whole lot of other trivial aspects that combine together to give a home its look. Dressing a home starts right from the entrance and moves inside. The most common and important element of dressing up the home comes in the form of furniture and accessories like cushions, throws, curtains, etc,etc....but what about the wall? The walls that make up the four sides of a room or space, too, need their share of importance, right? 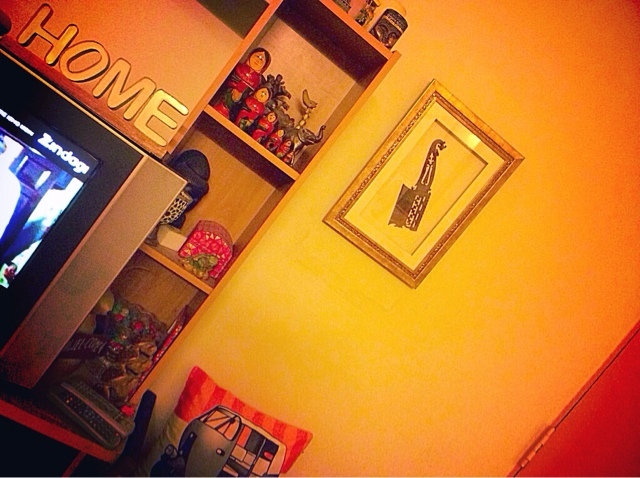 Today we are going to look into some simple and easy to incorporate ideas of dressing up and accessorising our walls. A couple of weeks ago,I visited a friend's home. What caught my attention were a few pretty and colourful frames on her walls. 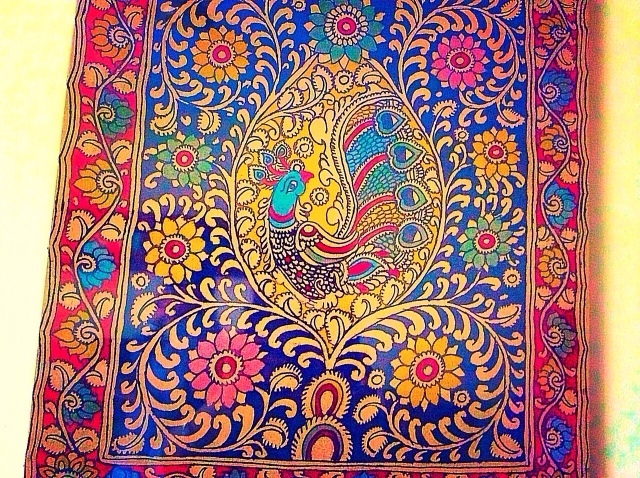 They ranged from Batik to Madhubani paintings to gift wrapping paper. The Batik and Madhubani framed pieces weren't the regular paintings that we generally get to see. They were actually pieces of cloth that were bound in pretty frames. A few of these grouped in clusters and behold! You have a unique look! 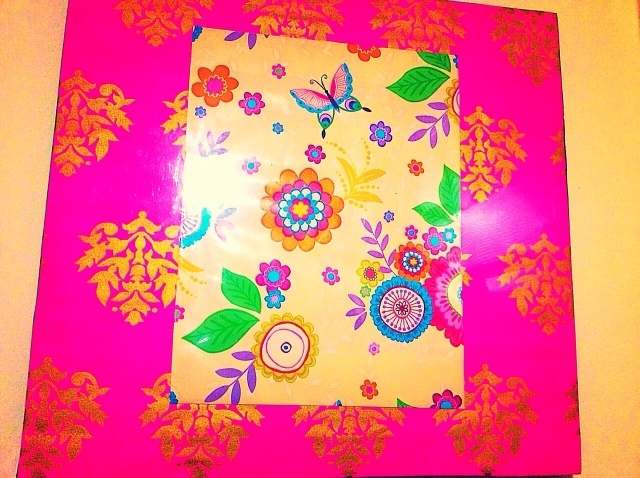 The gift wrapping paper,too, were given a new look by being framed. On speaking to my friend, I got to know that she and her son have together done this:-)....good way to keep our children busy, isn't it? Many a time, we have these pretty ones that we are reluctant to throw away. I remember how many times I have folded and stored the gift wrapping paper after unwrapping the gifts. They had been too pretty to be thrown away! Now I know what to do with them :-).... The wide varieties of these paper can give dull corner an instant glow. Well, this was an easy peasy instant idea! And we have many many more such ideas up our sleeves :-).... A virtual friend and an extremely talented person has used basketry on her walls! Unique, isn't it? Want to try out? Go on and try for yourself. I am sure you will come back to us with your pretty walls. 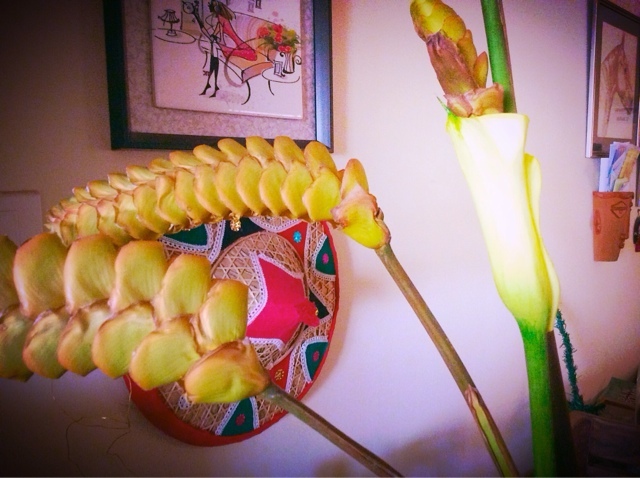 Images 1 and 2 are from my friend Aparna's home. Look, how cleverly gift wrapping paper has been turned into a piece of walk decor! 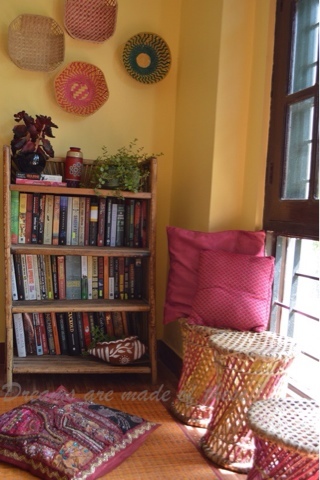 Reshma Sharma, another friend who blogs at Dreams are made of these,(http://rishhhhriti.blogspot.in/?m=1),has innovatively used her colourful baskets as a decor element. Isn't it gorgeous? 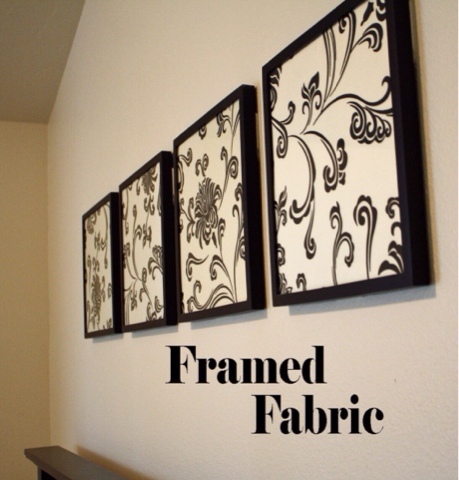 I loved this idea of framing up fabric pieces and this image is from the internet. One can use all prints and colours of fabric depending upon one's choice and requirement. This is another image from the internet. A few pieces of fabric or colourful paper can be framed and grouped together. A woven wall piece from the north-east. 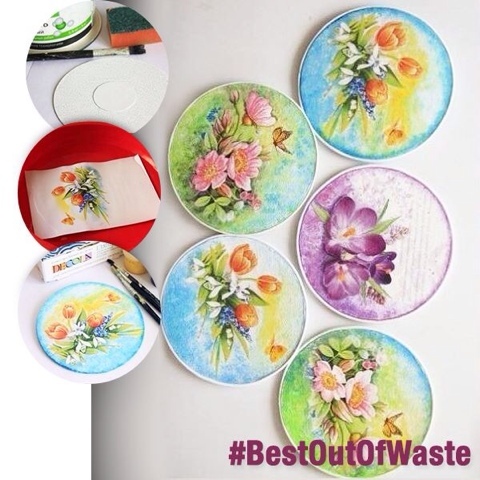 I have also used a framed and painted tile in my dining area. 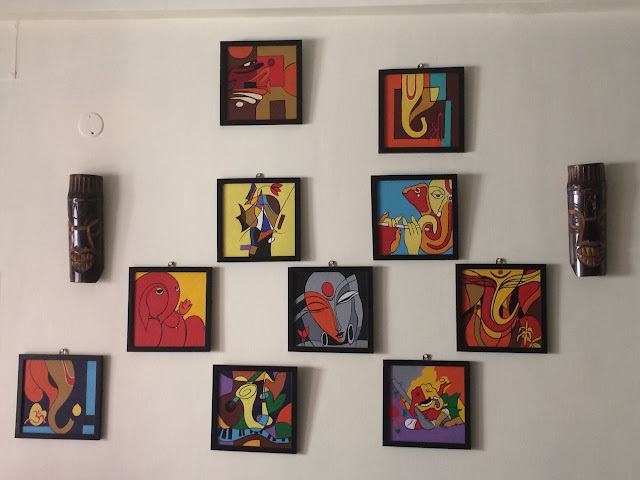 A gallery wall in my friend Kakoli's home. 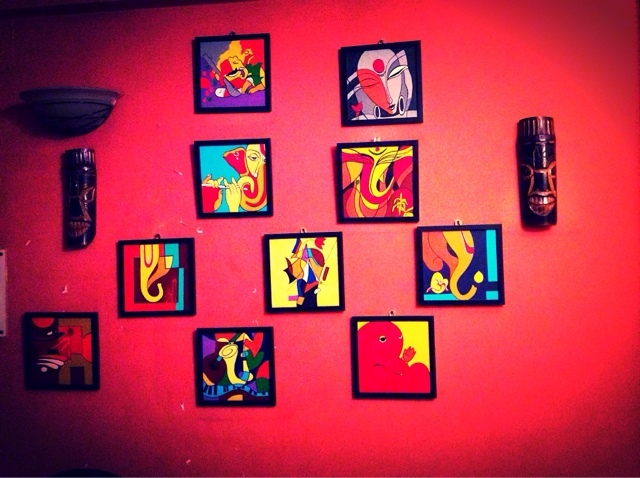 I loved the funky Ganesha photographs! Well, this wall decor is passé now. 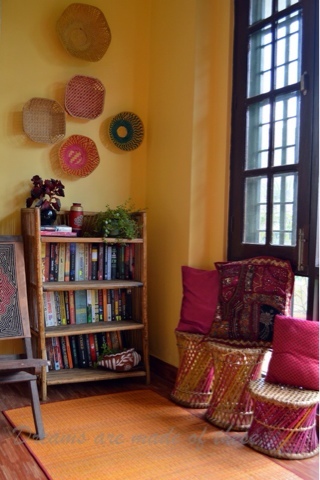 Finally, a recent photograph from my friend Kakoli's home. The rust wall has been painted and all I can say is that the pale background is complimenting the Ganesha gallery. 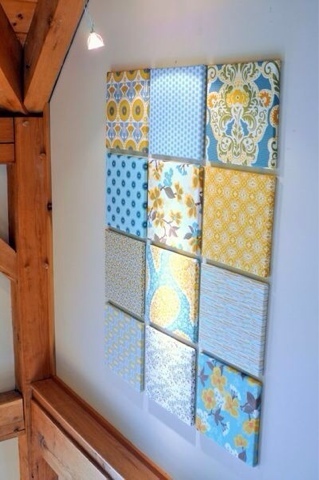 Three of the photographs have been borrowed from Pinterest ( fabric wall art ideas). Wishing everyone a happy and blessed new year. May all your dreams be fulfilled. May there be peace everywhere, within and all around us. Thank you so much Manasa :-)....some inspirations there from you :-)....you have a great year ahead!